We jointly commissioned a survey with New Start magazine, to find out how local authorities and residents can work together more effectively. The survey took place to inform our roundtable event on 3 November, which brought together a small group of key influencers to debate the opportunities and challenges of collaboration between communities and public services. Our survey showed that the overwhelming majority of local authority members, residents and volunteers want to see more collaboration between local authorities and communities. Greater involvement of residents was also selected as the best potential solution to the current concerns about delivering public services with reduced funding, ahead of involving local businesses and charities or sharing best practice. 81% of local authority members and 97% of residents agree that their local community could be improved if there was a greater input from residents. 40% of local authority members identified working closely with residents as the best potential solution to the current concerns about reduced public service funding, with 51% of residents reporting the same. 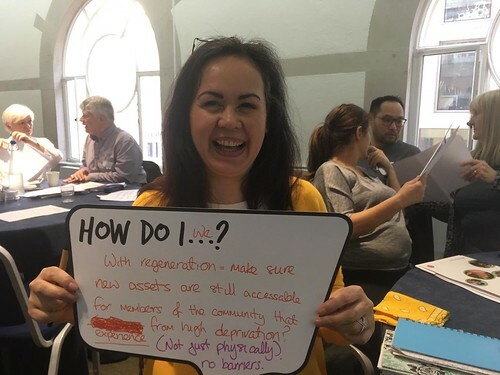 60% of local authorities believe that a collaborative, resident-led approach is currently feasible in their area, and 67% of residents agree. Both parties cite different expectations as a barrier to working together successfully (70% local authorities and 67% residents), along with a lack of understanding of each other’s priorities (58% local authorities and 82% residents/volunteers). In total, 63% local authorities and 80% residents agreed that the opportunity to discuss solutions together was an important way to overcome these challenges. More than half of all respondents agreed that barriers to collaboration could be overcome if there was greater open mindedness on both sides (54% local authorities, 64% residents). ‘These findings demonstrate huge support for greater collaboration between residents and local authorities. We believe that those who make up the community know best what's needed and are most likely to come up with the solutions to make a lasting positive difference to the places where they live, work and socialise. In a way, residents are the best kept secret when it comes to driving change in the community, and it’s encouraging to see this potential recognised. But in order to work together, there needs to be a mutual understanding of different perspectives and more opportunities to get to know each other’s priorities. In total, there were 203 respondents to the survey. These included those identifying as local volunteers (who we have referred to as residents), those who work for local authorities and those who work for charity and voluntary organisations. Download full summary of survey findings.